Ada pertanyaan untuk Salcedo Suites Hotel? 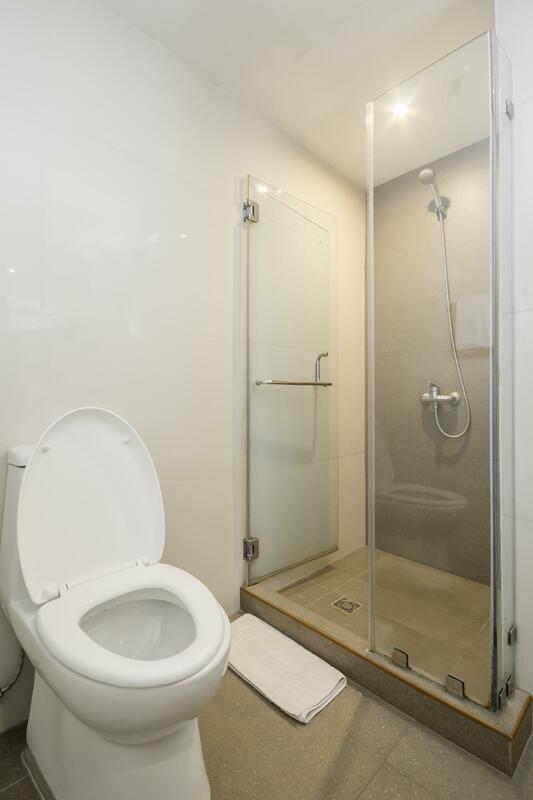 Ideal untuk bersenang-senang dan bersantai, Salcedo Suites Hotel terletak di area Makati Manila. Hanya dari sini, hotel bintang 3 ini dapat secara mudah diakses dari bandara. Sebagai sebuah tempat untuk beristirahat dan bersantai, hotel ini terletak hanya beberapa langkah dari berbagai obyek wisata kota ini seperti Kedutaan Besar Malaysia, Kedutaan Besar Kerajaan Arab Saudi, Kedutaan Besar Argentina. Gunakan kesempatan untuk menikmati pelayanan dan fasilitas yang tidak tertandingi di hotel Manila ini. Ada beberapa fasilitas hotel ini seperti satpam 24 jam, layanan kebersihan harian, resepsionis 24 jam, tempat parkir mobil, layanan kamar. Akomodasi hotel telah dipilih secara cermat demi kenyamanan maksimal dengan adanya akses internet - WiFi, kamar bebas asap rokok, AC, meja tulis, balkon/teras di beberapa kamar. Daftar lengkap fasilitas rekreasi tersedia di hotel termasuk pijat. Salcedo Suites Hotel adalah tempat menginap ideal bagi para wisatawan yang mencari pesona dan kenyamanan dari Manila. Pros: Near fastfood chains and the Makati Sports Club if you have an event. Room assigned to us is blocking the sun so if you love that there is no sunlight coming in the room, this one is for you. And oh, we were allowed late check-out, the staff was super kind to us. Cons: Only two parking slots for ALL guests, street parking will cost you php 110/4 hours and you have to move the car again to another slot. Too hassle/ expensive. My family and I stayed overnight for an errand in Makati. We chose this location because it was the perfect place to be in as it is walking distance from the place we had an appointment in, and a good breakfast place is just about a 8 minute walk. We got two rooms, and I requested for us to be all in the same floor, and they made this happen. Which was very nice indeed. However the rooms are okay, it’s really a place for overnight or so. If you are going to bring a car, beware: it’s very tiny, you really have to be extra extra cautious when driving. There is a hot and shower, and the air conditioning worked just fine. Good value for money. Nice staff. Good for someone on a budget. my stay was fine the room was big. but with some issues. no free bottled water as what agoda says free as inclusion. stayed for 2 night but room cleaning was not done. but ican recommend this place if you are to stay in makati. I booked a superior room but got disappojnted when i saw the room; it was dilapidated, and run-down old. The fridge was like what we had when i was a kid; the aircon was blowing air but apparently not cold enough; the bed was small and shabby. The room itself was old and creepy. I asked if i could transfer to a one bedroom suite, the staff were nice enough to transfer me but i had to pay more than i expected for an old hotel. It was a one-night stay. Best points were the location and spacious room and bathroom. The bad points were the lack of a kettle and cookery/crockery which made the kitchen effectively useless. The TV and refrigerator had also seen better days. It is not a full-service hotel but for this price in Makati it was a good deal. 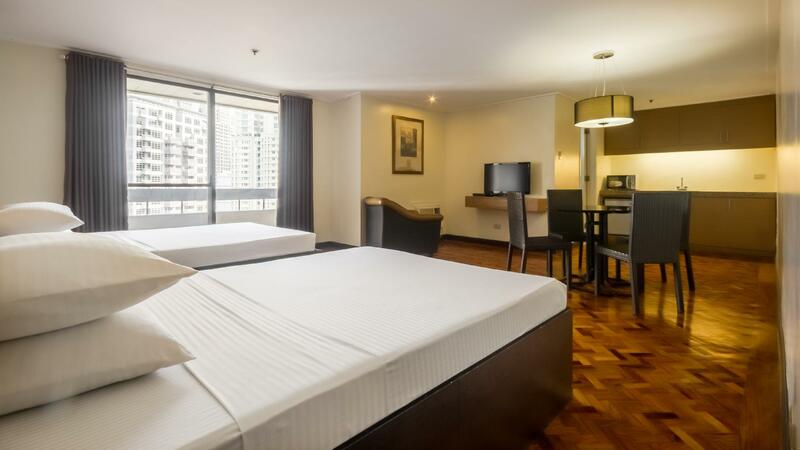 the hotel is located at the heart of the makati cbd. it is about 500m walking distance to greenbelt/glorietta malls in makati. there are nice restaurants nearby, as well as coffee shops. fast food shops are just across the hotel too. the hotel offers the basics, and is considered value for money. it doesn't offer much amenities/facilities. they are good for business travelers, or those who'd spend only the night in the hotel. check-in was efficient. i got my keys in 1 minute. The only selling point is the location and the rate. This apartment/hotel should not be rated 3 stars. I've stayed in 2-star places that are way better. Sure the room rate was low for a place in Makati, but I wouldn't stay here again even if they offer a bigger discount. The smell of insecticide was overpowering, yet a huge cockroach greeted us when we arrived. The bed cover was a tacky hot pink satiny material. The room just looked and felt old and dirty. The location of the place is good but nothing else responded to what I thought I was paying for. The room old and rather crappy. The bathroom was a disaster. They cleaned my room once - when I asked for it. The never brougt me the extra towel they promised. And taking how lovely people in the Philippines in general are, the staff was nothing special. I was very disappointed with the quality (the lack of it) of the place - and heard at the end of my stay that I had even been upgraded to a better room that I actually was paying for! Would never have thought, and do not want to know what their standard rooms are like. This Makati hotel impresses its guests with its first class accommodations and top-notch service. The rooms of the Salcedo Suites are spacious and designed to give you all the comforts of home. It truly is one of the top hotels Makati has to offer. Guests can choose from our 147 well-appointed guestrooms with a choice of studio, one-bedroom, or two bedroom suite accommodations. 24-hour room service and non-smoking rooms are available. The location is nice and the room is big. The problem is that the faucet in the wash basin wasn't working at all. So I can't even brush my teeth unless I have to go to the shower and do it from There. Also, the flush didn't work. I arrived at 9.30 pm. I called reception for help but told me the maintenance left already so I have to wait the next mOrning to have it fixed. However, the staff are kind. It's just that everything in the room wasnt working so I paid for a room That has no flush and no water from the washbasin. 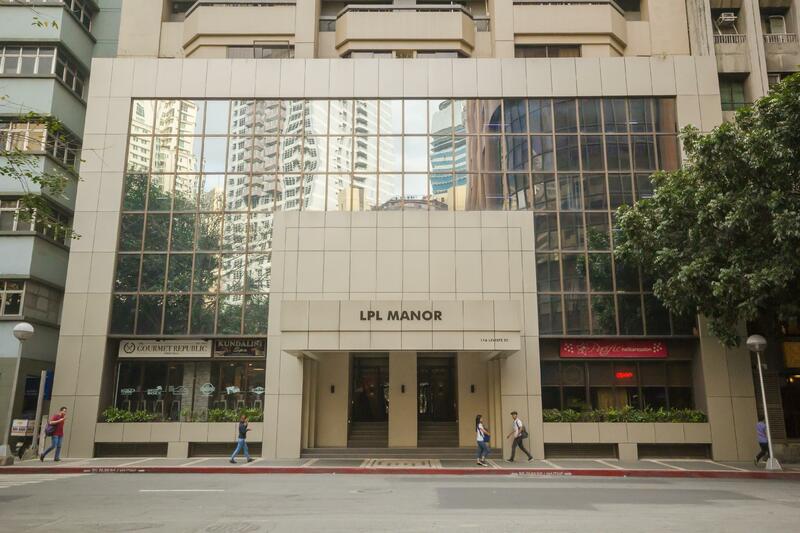 Location is good - centre of Makati and close to main business area. Price is certainly OK, for the area. Hotel is made up of flats, so the rooms are large, with a separate bedroom and 'lounge' and small kitchen. But the facilities are very old. Bed is not new, bathroom not new, curtains hanging by threads, etc. Get what you pay for! uneventful, other than one elevator was under repair so wait for elevator was a bit longer that my New York mentality could easily tolerate, but overall good hotel at good price. Nothing fancy but clean and spacious. The building is already old. I had a hard time sleeping since I was too afraid the building might be on fire and we were in the 22nd floor. The elevators are already old and we were afraid too that we might be stuck inside. The room however, was pleasing. It's just that the closet was a bit old and dusty. I had to take my anti-allergy meds. We checked out alive though. It was an overall pleasant experience. The place is accessible to most of my itinerary in Makati area. Walking distances to banks, testing center and a park is located nearby.